I hear it all the time: "I don't have enough time!" The truth is everyone has the same amount of time that everyone else does . . . 24 little hours! Time is a limited commodity. Duh! I know that with our busy lifestyles, there never seems to be enough of it! If you want more of it, it's time to take stock of your life and become more organized. That's where time management tips and organization can help. This article is designed to give you a short course on home organization ideas that can help you find your stuff and find more time! Time Management Tips #1: Just think, what if you misplace your car keys 3 times in a year and you spend 30 minutes each time looking for them? That's 90 minutes a year. What if you can't find the TV remote once a week and spend 5 minutes each time looking for it? 5 X 52 = 260 minutes a year! That's almost 6 hours of your precious life that you can't get back. That's 6 hours you could have spent playing a round of golf or a set of tennis. You could have had dinner enjoying time with your family or friends or pursuing your favorite hobby! Need more incentive? Take that 6 hours and multiply that by your hourly wage . . . see how much money you could have saved? 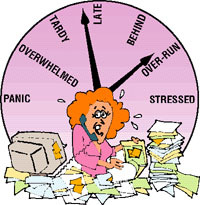 Time Management Tips #2 Realize that the words organizing and organic come from the same root word. I mention this, not to bore you to death with trivia, but to realize that getting your life back and being organized is an "organic process." It's not something you do just once and forget about it. You will take a few steps, do a few things, then step back, re-evaluate what you've done, and then take a few steps more. But you don't have to spend every waking hour organizing. Time Management Tips #3 We often tell ourselves what I call convenient lies about ourselves? Why? It's a procrastination and avoidance mechanism. It doesn't have to be that way! Realize that your subconscious mind only knows one word, OK. If you tell it something, it says, OK then starts feeding your mind data to support what you just told it. Therefore, if you tell yourself: I'm unorganized, your subconscious says: OK then proceeds to show you all the things to support that you are an unorganized person. If, however, you tell yourself: I can BE organized, once again, your subconscious mind says: OK then proceeds to show you all the things to support what you just told it; you can BE organized! Don't just take on a project. It takes more than just a few tips and tricks to get and stay organized. It takes a lifestyle change. These time management tips will help you make the long-term life changes that are needed! I look forward to welcoming you as my guest! For more great tips and information on goal setting and time management, visit Gary the Goals Guy Gary Ryan Blair helps NASA set goals. His products and information are invaluable. Having attended one of his seminars, I highly recommend Gary and his products.